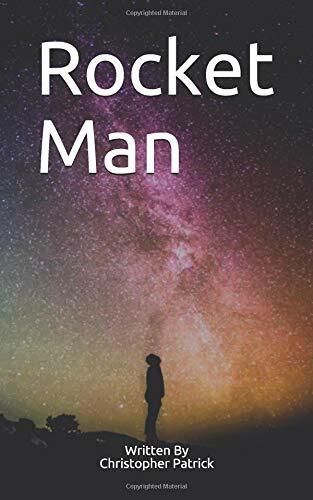 If you follow the blog or the stuff I write, then you’ll know I put out a new short story called Rocket Man, which is one story I’ve written that I really love. It would be great to get as many people to read it as possible. So in an attempt to do just that, here is the first part of the story. Have a read and if you like, get your copy of the story below. “I count the stars some times too,” she said. It was Diane, Matt’s crazy chain-smoking neighbor. She was standing at her fence, looking up at the night sky. He wasn’t in the mood for company, this was why he came out here, away from the black veiled tears and the crying strangers that had gathered in his house, stinking up his carpets with grief and stealing the now-stale food from his kitchen. Diane had always been kind whenever they had passed each other on their street; she didn’t say much and said just enough, making her the perfect neighbour in Matt’s eyes. Lisa had always liked her too. She said Diane made her feel like she was a heartbeat away from the Swinging Sixties, with a hippy for a neighbor – a neighbor that, on occasion, had more flowers in her hair than in a well-kept flower bed. Looking at her now, Matt realized what Lisa had meant; the way Diane dressed was like nothing in this world, never mind this era. She wore an Indian-style long dress that was brightly coloured, with a rainbow bull’s eye in the middle and a pair of sandals that looked like they were made of wicker. Her hair was wiry and frayed; like she’d perhaps stuck her fingers in a socket and liked the way it set off her eccentricity. He realized that he’d been staring at her without saying anything for nearly a minute now, the silence stretching between them like a kid ready to fire an elastic band at his least favorite teacher. He looked up at the stars again and let their glare rain down on them both. She didn’t seem to mind the silence, which was good, because he wasn’t much in the mood for talking. Diane, already halfway through her own, smiled. “It’s never too late to start a bad habit.” At this, Matt laughed and took another draw. The two perfect strangers smoking in silence on a nippy November night. “How’s little Tommy holding up?” she asked. Not taking her eyes away from the smoke rings and the stars. “Before. When you said you count the stars. What did you mean? She smiled and reached her hand over the fence and gave Matt’s a little squeeze. “I want to make sure my family’s got plenty of friends up there too.” And with that, she patted Matt on the shoulder and disappeared like a ghost into her own house. Matt sat there a few moments letting her words sink in. How could she possibly know? A few months before it happened, he and Lisa had been sitting on the porch as he was now and looking up at the stars. She was nagging him for neglecting the telescope she had bought him for this 40thto which he’d promise he would use and soon. According to the box you could see onto the face of planets, moons and stars. “You never know. You could be the first man to find life on other planets. Just like you always wanted,” she had teased. “This your plan all along? To get me back to work?” he laughed. She just wrinkled her nose and smiled but he knew there was some truth to it. She’d been so angry when he’d left his job that she called is bosses at NASA and tried to get them to take him back. But, as Matt had told them (he had some pull their being one of their chief engineers – a literal rocket scientist) they were in no way to listen to her even if they wanted to bring him back to the space programme or make her happy. Leaving the space agency had been one of the tougher decisions (it had been his dream as a child) but the time it had given him with Lisa and Tommy was more than any project, build or mission could give. They had been out there for an hour now and he was worried she was getting too cold. As if to ease his fears she brought her cardigan close over her shoulders and leaned into him, never once looking away from the night sky. It was true; he did little but these days. Lisa always knew what he was thinking before he did. He didn’t respond, just held her close. That was the last conversation they had had when it was just them; they way they had been forever before. The last time Lisa had a good day and the last time they sat out together looking at the night sky. He stubbed his own cigarette out and made his way back inside. He figured Diane must have overheard them talking that night. Whether she was being cruel or kind he hadn’t decided. Although, after what would happen next, he wouldn’t pay a second thought to his neighbour’s motives, whether it was a cruel trick or a kind word wouldn’t matter. That conversation beneath the stars, smoke and silence swirling between them both, wouldn’t even fall on Matt’s radar again. Not after what was about to happen. Not after Matt saw it. Just days after Lisa had left Matt, Tommy and the rest of their family and friends behind for a life amongst the stars and just days after this quiet conversation between two strangers, everything was about to change for Matt, Tommy and everyone in the town that Lisa had departed. Just days after Matt believed he’d lost everything; he thought he’d found something again. No, this conversation, and any that followed wouldn’t matter to Matt. Not after the night he saw the face in the sky.